Both these roads are in Rainow parish. Smithy Brow runs from the Poacher’s Inn at the end of Ingersley Road up to the junction with Spuley Lane, Blaze Hill and Oakenbank Lane. Blaze Hill continues up to the Macclesfield / Whaley Bridge road. These are both country lanes with very few houses and the occasional farm. Leads to Spuley Lane, Oakenbank Lane, Rainow village, Whaley Bridge. 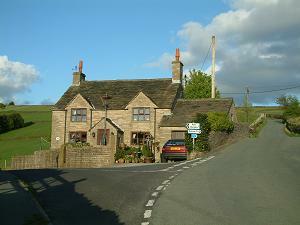 Nearest pub – Poacher’s Inn at the bottom of Smithy Brow. The cottage to the right of the triangle at the top of Smithy Brow used to be the smithy. There are outstanding views from here on up to the higher level of Blaze Hill. For more on brows see the special page.